CEO and founder of the Stamford-based Wright Insurance Agency, Suzanne Malloy Zaleski, is announcing the launch of a charity campaign to help provide food to families in the region who deal with hunger on a daily basis. Funds raised will be used to offer nourishing meals to residents struggling with food insecurity. “Having a centralized location that offers support is a vital pillar of our community to help families facing food shortfalls, and we are proud to help in the mission of providing for those in need,” said Zaleski. The Wright Insurance team is also unveiling an invitation program to involve the local community. 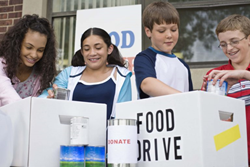 For everyone invited into the firm to receive a no obligation quote on a new insurance policy, Zaleski has pledged to make a $10 donation that will be used to provide meals to hungry families. For additional information on how to support this campaign, or to suggest new causes for the Wright Insurance team to support, the following page has been made available: http://wrightquotes.com/rewards/. As a Personal Insurance Representative in Stamford, agency owner Suzanne Malloy Zaleski knows many local families. Her knowledge and understanding of the people in her community ensures that clients of the Wright Insurance Agency are provided with an outstanding level of service. Suzanne and her team look forward to helping families protect the things that are most important – family, home, car and more. The Wright Insurance Agency also offers clients a preparation strategy for achieving their financial goals. To contact an expert at the Wright Insurance Agency, visit http://wrightquotes.com/ or call (203) 973-2983 in Stamford or (203) 855-8444 in Norwalk.